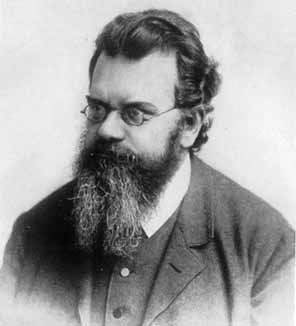 Ludwig Boltzmann (1844-1906) helped develop statistical physics and established a complex understanding of entropy, all while possessing a beard you could lose small pets in. My intellectual relationship with most scientists is fairly uncomplicated: I have no trouble writing about Albert Einstein (the founder of my primary area of study, general relativity), or about Emmy Noether (whose famous theorem marks reveals deep mysteries of nature). I’ve highlighted Charles Darwin, Marie Curie, Nicolaus Copernicus, Omar Khayyam, and others without any problems, other than a vague worry that I’m perpetuating the Great Man view of history, with bonus Tokenism added for good measure. So why do I have so much trouble writing about Ludwig Boltzmann? My guess is that many readers haven’t even heard of him, or if they have, they don’t know a lot about him. One of the better discussions of his science is in From Eternity to Here by Sean Carroll, who devotes quite a bit of space to talking about Boltzmann’s role in the early understanding of entropy. As is my custom, I intended to write about entropy, using Boltzmann’s February 20 birthday as my starting point, but I stalled out. Not because of the entropy explanation–complicated as this subject is, I’ve taught it on many occasions and it holds no terror for me–but because of the man himself. While I usually spend a few short paragraphs at most on the scientist and focus instead on the science, I found myself struggling to say anything at all about Boltzmann before giving up and moving on to other writing. Austrian physicist Ludwig Boltzmann was one of the pivotal figures of 19th century physics, standing with a number of other scientists at the juncture between the 17th and 18th century mechanistic way of seeing Nature, and quantum mechanics that had yet to emerge, but which owed its beginnings partly to Boltzmann. He was born in 1844, died in 1906, and in between helped to develop statistical physics into a true rigorous field of study, including most significantly his ideas about entropy. Though it’s a dangerous cliché to say it) much of what he thought about was very much ahead of his time. Part of the reason I feel a little safer to say this about Boltzmann than others (like Einstein) is that he seemed to wrestle with entropy, contradicting himself between different writings, showing that the idea was new not only to everyone else, but to him. There’s no way you can gloss over the fact that he himself was striving hard to understand something, and not always successfully. I find it difficult to write about why Boltzmann is significant, because he’s one of my scientific heroes. That phrase alone requires some explanation, I feel: hero-worship is dangerous business, and I don’t subscribe to the Great Man view of history, in which Everything Worth Doing is the result of the action and thought of Great Men. Just as evolution via natural selection would have been introduced even without Darwin (and in fact were worked out independently by Alfred Russel Wallace) and relativity would exist without Einstein, I don’t think only Boltzmann was capable of developing the statistical view of entropy. He wasn’t a lone genius: he had friends and colleagues who helped him flesh out his theories to counterbalance his powerful intellectual enemies (such as Ernst Mach). Maybe for this reason in part, Boltzmann feels more human to me in a way I can understand. Einstein struggled with theories too, but he also had a huge degree of celebrity and success. It’s hard to say anything new about him, in other words. (Einstein also had real enemies in the form of anti-Semites and J. Edgar Hoover who were potentially dangerous to his life and livelihood. Of course, he managed to escape Nazi-ruled Germany and find refuge in the United States, and Hoover’s FBI wasn’t really more than a nuisance to him.) Boltzmann has had a lot less ink—digital or analog—spilled about him, so while studying him over the last 15 years, I’ve grown attached to the beardy guy. So I have to say, I feel somewhat protective of him. You see, Boltzmann was mentally ill: he suffered at least from severe depression and episodes of extreme self-doubt. Some biographical accounts I’ve read indicate he may have been bipolar, though that’s unclear: he did seem to go through periods of highly elevated activity, working for days on end without much break, which is suggestive of manic episodes. However, diagnosis today of someone who lived over 100 years ago is sketchy, so in my unprofessional opinion, there’s insufficient data to say he was manic. On the other hand, Boltzmann’s depressive episodes unquestionably happened, and his struggles with believing his work to be worthwhile are documented in his own writing, as well as contemporary accounts from friends and family. Apart from his scientific work, Boltzmann wrote a long poem in which he traveled to Heaven and met his favorite composer, Ludwig von Beethoven, who was continuing to write music. However, the new pieces Beethoven wrote were mediocre at best (as the man himself admitted in the poem); when Boltzmann asked him why, Beethoven responded that without the pain of life to motivate him, he couldn’t find inspiration anymore. Whether the physicist associated himself with the composer—seeing his personal struggles as the source of his scientific powers—is unclear to me, but it’s certainly in tune with Romantic ideals. Beyond that, I hesitate to go. While the idea has mostly fallen out of favor that depression and other mental illnesses are the wellspring of creativity, some people still hold on to it. Would Boltzmann have been as creative in an era of psychiatric medicine, or even where fewer stigmas against depression exist? Neither of those questions seem particularly relevant to me (though see the book Touched With Fire for another viewpoint). Instead, it seems that if help had been available to Boltzmann, perhaps things might have been different for him. While on vacation in Italy with his family in 1906, Ludwig Boltzmann, one of the most brilliant and original physicists in the world, hanged himself in his hotel room. This piece deserves comments. I came to if from a Google+ reference by Sean Carroll. I hope you also do a piece on entropy itself. Here’s a question: how would you determine the entropy of a manufactured product, e.g., a iPhone? Boltzmann’s suicide had a profound impact on his daughter (who found the body). There was also a commemorative plaque installed in 2006 at the hotel where the suicide occurred. Since I worked on a quantum mechanical Boltzmann equation as a grad student, I became a huge fan of his. Later I went to the Kamerlingh Onnes Labs for a post doc and found the Ehrenfest Reading room a treasure trove of old works from that period. Paul Ehrenfest was Lorentz Professor there up until 1933 when he committed suicide, like his research director before him, Boltzmann.